One of two men found guilty of murdering City lawyer Tom ap Rhys Pryce during a mugging has had his minimum jail term increased. The Court of Appeal ruled the 17-year term handed to Delano Brown, 19, was "unduly lenient" and raised it to 20. But the 21-year minimum tariff imposed on Donnel Carty, 19, in November, was found to be "perfectly appropriate". 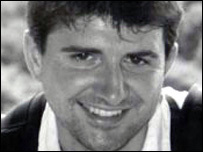 Mr ap Rhys Pryce was stabbed twice in the chest in Kensal Green, north-west London, in January 2006. The Lord Chief Justice, Lord Phillips, sitting with two other judges, passed the judgement on Monday. They had been asked to review the case by the Attorney General, Lord Goldsmith QC, who considered the terms did not sufficiently reflect the "very serious nature" of the case. 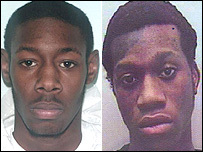 Submissions, made on behalf of Carty and Brown, that their sentences were too long were rejected. The two men were convicted of murdering the 31-year-old after a three-week trial at the Old Bailey in November last year. During the trial, jurors heard Mr ap Rhys Pryce was walking home from Kensal Green Tube station when he was attacked late at night on 12 January 2006. Prosecutors said the victim had probably fought back as the teenagers attacked him and demanded his belongings. Officers found a trail of blood and personal items leading towards his nearby home in Bathurst Gardens, which he shared with his fiancee.